Life gets crazy. Busy. Hectic. And sometimes we just need a quick, delish dinner. When I have days like that, I have a very simple go-to recipe that is (almost) healthy, very modifiable, and enjoyed by the young and old in the family: tacos. I knew little of Mexican cooking--and quality Mexican food--growing up in New Jersey. Sure, our bagels, delicatessen, Chinese, etc. rocked, but Mexican usually meant those stale, cardboard-like, "corn" molded tacos in a box. Not fabulousness. Fortunately for me, I married an awesome man from Southern California. Shortly after moving out west, my darling hubby introduced me to Taco Night. Crunchy but light corn tacos with savory meat and toppings of our choice--it was the perfect fast food. In fact, we could easily whip this delicious treat together in less than 20 minutes. We usually made tacos on Thursdays, and happily consumed these babies while watching Friends on TV. Ahhh, the honeymoon years. We had fun making them side by side, and had even more fun consuming them side by side. Now, our lives are busy-crazy. We work, we volunteer, we have two adorable rugrats ... And the one night they look forward to? Taco night! - Heat a large saute pan over medium high heat. 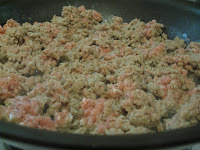 Add ground turkey. - Season meat with garlic salt and pepper. - Using a spatula, break the meat into small pieces. - Let cook for about 10 minutes, or until meat is browned/cooked through. Remove from heat. - While meat is cooking, add about 1/4 inch to 1/2 inch of peanut oil to the smallest skillet you have (usually an omelet skillet--should be just big enough to hold corn tortillas). Turn heat to high and wait for a good shimmer to appear on the oil. - Add one tortilla to the oil, and let it bubble a bit. - After about two minutes, flip the tortilla. Let cook another minute. 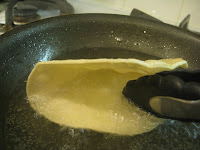 - Using tongs, fold tortilla in half and let cook another minute. - Flip folded tortilla. Use tongs to to hold tortilla shell open a bit. Fry for another minute, or until a kiss of golden brown appears. 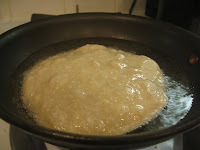 - Remove tortilla, being careful with draining oil as you lift if out of the pan. - Repeat with remaining tortillas. 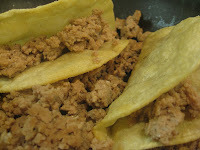 - Take a scoop of meat and place it in a tortilla. Top with grated cheese and any other topping you like. Add salsa. You are going to laugh. I'm frrrrrrrrrreeeeezing. And unlike most of the country suffering with deep frosts and onslaughts of snow, I live in Southern California. Our "freezing" falls around the 68 degree mark. It's extra embarrassing because I spent 25 years living in the Northeast. When I moved out, I mocked my fellow Californians who complained about this kind of weather -- 68 in winter?! Heaven. Fifteen years later and now my blood runs thinner. I am used to (and prefer) temps in the 70s and 80s. But one thing has remained the same over the years: When it's colllllllld, I want soup! I am a huge lover of all sorts of soup-- from Asian varieties to Jewish Pencillin (aka chicken soup) to rich and decadent cream soups to my beloved French Onion Soup smothered in melted cheese.... But we've entered the New Year, so I need to be "good." 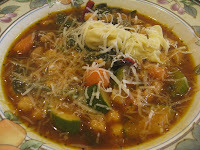 My solution: Minestrone! 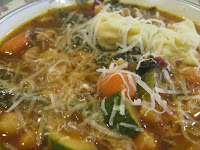 I first sampled minestrone as a young child (about 2 years old) at my parents' (and later my) fav Italian ristorante. The rich tomato broth, the filling veggies, noodles, and parm cheese made me happy-happy! And on tonight's chilly winter night, it totally hit the spot, warming me up and making happy-happy! * This recipe can easily be modified to your own tastes. 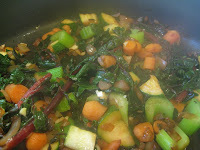 For instance, you can increase/decrease veggies and beans per your preference. Tortellinis can be substituted with small pasta tubes (which are traditional for this dish), another shape of pasta, another type of tortellini, or skipped altogether. In a large, deep pan, heat olive oil over medium-high heat and add onions. Saute until they are tender and have a slight golden hue. 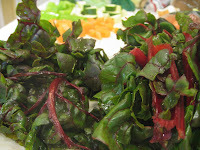 Add chard and saute for about two minutes, until chard has wilted. Push chard and onions off to the edges of the pan. 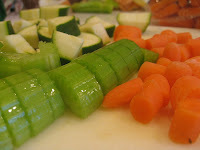 To the center of the pan, add zucchini, carrot and celery and cook for another 5 to minutes, or until the veggies have softened. 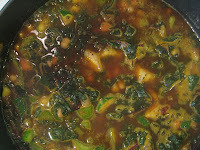 Stir with onion-chard mixture. Add garlic, saute for about 1 minute. 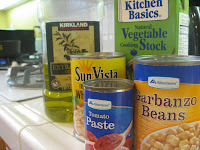 Add tomato paste, stock and beans. Stir to combine and then add spices and parmesan cheese rind. Stir and taste for seasoning. Lower the heat to medium low and let simmer for about 20 minutes. Meanwhile, prepare tortellini as directed (to al dente). Drain and set aside. After soup has simmered, add pasta and lovingly ladle into bowls. Generously shower parmesan cheese on top. I love pasta. Ziti, fettucini, linguini, penne, gemelli... you name it. And I'm always looking for new ways to sauce up the noodles and enjoy my carbs. Tonight's feast started with two basic ingredients: bacon and cauliflower. One of the yummiest sides you can imagine is oven roasted cauliflower, especially if you drape some bacon over the florettes or use a baking sheet with bacon drippings. So delish. Well, if bacon and cauliflower work well together, and bacon and pasta go well together (think carbonara and l'amtriciana), shouldn't they all rock together? YES! Of course, they will need some extra components to help them sing. Aromatics are a must. I would have used shallots, but we were fresh out. Selected substitution: red onion. How about a cook's best pal-- Mr. Garlic. Next, we need cheese. Freshly grated parm will work perfectly. For the "sauciness" factor, I turn to best buds white wine and chicken stock. And now for a secret ingredient.... something with a subtle flavor that will deepen the intensity. But nothing scary--we want the kids to eat this. Oh, yes. I've read about an ingredient that melts into oil, adds depth of flavor and salt. And I just so happen to have it - a tin of anchovies. Did I lose you with the anchovies bit? Anchovies have that built in "ewww" factor, right? Not really. I mean, most of us eat Caesar salad. We just need to temper the fishy factor while harnessing the umami and salty goodness. Trust me, people. It will work! The final choice was pasta type. You really could use any shape and style. I felt like the linguini was calling my name, and the nutty whole wheat variety sounded like a good accompaniment. Feel free to mix it up to meet your carb needs/desires. Now, before we proceed, gentle reader, I must apologize. You see, this was an experimental recipe, and I wasn't quite sure how it would work--if it would work. Plus, I had a couple hungry, whiny kids asking about the readiness of dinner. So I skipped prelim pics. And, as it turns out, it was very, very good. So much so, that there wasn't anything left to smile pretty for the camera. So I guess you are going to have to trust me on this one until I make it again. And, yeah, I am totally make this again. Bring a large pot of water to boil. Add kosher salt and pasta, and cook pasta until about 1 minute below al dente per box instructions. Drain, saving one to two cups of pasta liquid. Meanwhile, add olive oil, bacon, anchovies, and oil from tin into a large, deep pan over medium low heat. Using back of saute spoon, encourage the anchovies to melt into the oil (ie, break them up a bit). Cook for 3 to 5 minutes. Add onion and garlic, and saute for another 3 to 5 minutes. Add cauliflower, stir ingredients to combine. Add wine and stock, raise heat to medium, cover pan. Let cook another 10 or so minutes until the cauliflower gets soft and tender (but not mushy). Remove lid and add drained pasta to pan. Add some of the cooking liquid to help foster more of a sauce feel; do this a bit at a time until you have your desired consistency. Add parm cheese, and stir. Serve in bowls, with sprinkle of parsley and some more freshly grated parm on top. Delicioso!